Athens, Ga. – Senior Lauren Haeger set the Gator and Southeastern Conference career home run records as the No. 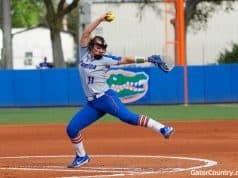 2-ranked University of Florida softball team clinched its fifth consecutive SEC series victory on Saturday with 8-4 and 4-3 victories against No. 11 Georgia at Jack Turner Stadium. Haeger earned the win with a complete-game effort in Game 1 to move to 20-0 on the year, while Aleshia Ocasio (15-3) worked six-plus innings before yielding to Delanie Gourley, earned her third save in the nightcap. 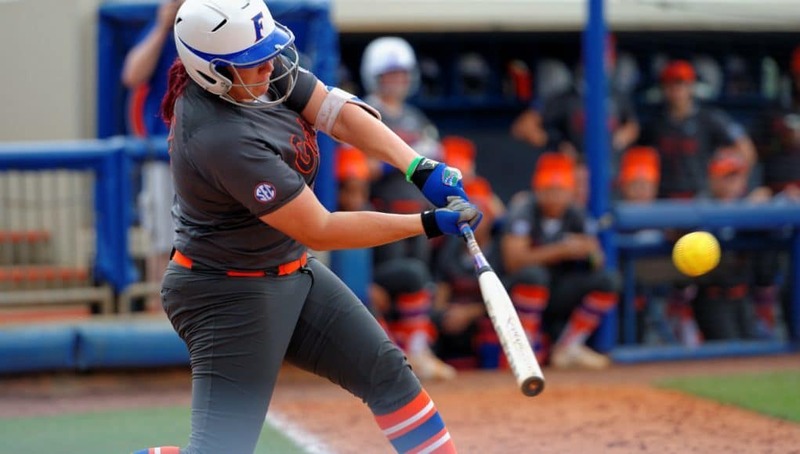 Florida put up four runs in the first inning of Game 1 on Haeger’s historic 65th career homer. Kelsey Stewart andNicole DeWitt singled before Kirsti Merritt was hit by a pitch to set the stage for Haeger, who launched a 2-1 pitch over the left-center field fence for a grand slam to give Florida a quick 4-0 lead. The Bulldogs answered with a three-run homer in the home half. Georgia continued the scoring and tied the game in the third with a solo home run to center. The teams traded three scoreless frames before the Gators loaded the bases on three singles to start the seventh. DeWitt then pulled a go-ahead grand slam down the right-field line to put Florida back in front 8-4, producing the final margin in the series-opening win for the Orange and Blue. As in Game 1, Florida jumped out to an early lead in the second contest thanks to a home run. Merritt and Haeger both singled with two outs to bring up Bailey Castro for a three-run shot down the left-field line. Both pitchers kept the opposition off the scoreboard from that point until the fifth inning, when Georgia cut the UF lead to 3-1 with a solo home run to left. Kayli Kvistad reached on an error to lead off the seventh, and pinch-runner Jessica Damico scored two batters later on an RBI groundout by pinch-hitter Briana Little. Georgia hit back-to-back solo home runs to start the home half of the inning before Delanie Gourley entered and struck out the side to save the 4-3 win. Lauren Haeger: The senior added the UF and SEC career home run record to her Gator RBI and walks benchmarks, while winning her 20th consecutive decision to begin the season. Nicole DeWitt: The freshman’s game-winning grand slam in the opener marked her first career home run. Bailey Castro: The fourth-year Gator hit her fifth home run in seven games since April 3 during Game 2. Haeger’s grand slam was the 66th home run of her career, breaking a tie with former Gator All-AmericanMegan Bush for sole possession of first place on the Florida and SEC home run lists. The bases-loaded home run marked UF’s seventh grand slam of the season. Haeger hit her first grand slam since May 17, 2014, vs. Stetson during the NCAA Gainesville Regional. The Arizona native earned the win in Game 1 of an SEC series for the sixth consecutive week. Florida hit two grand slams in a game for the second time this season (also: Feb. 22 vs. Mercer – Game 1). DeWitt notched her third career game-winning RBI (last: Feb. 7 vs. Illinois State). Castro’s Game 2 home run was her first in 10 career games against Georgia. Stewart hit safely in both games, extending her hitting streak to 14 games dating back to March 27. Gourley’s save in Game 2 was the fifth of her career. The Florida-Georgia series concludes Sunday at 1 p.m. ET on ESPNU. 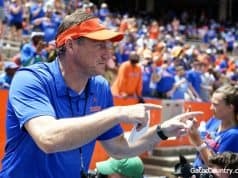 Florida Sports Talk will have the radio broadcast with Corey Brooks (play-by-play) and former Gator All-American Megan Bush (analysis) on the call. 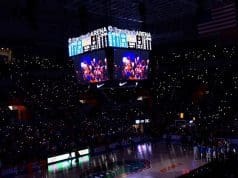 In addition, a live stats link can be found on the schedule page on GatorZone.com.